This is a Tribute to Docky, Who Inspired ABC-Animal. You were 5 years old and you were the most beautiful chocolate Lab in the world! You lived on a farm with an adorable family. And you had serious joint problems…which isn’t surprising for a Labrador! You walked on 3 legs. It was hard for your foster family to watch you suffer. That’s when our paths crossed. Eureka! It was love at first site! My life changed forever. I promised you I would always be there for you. Like Cosette in Les Misérables, you became a princess, no, a queen! At that time, I thought I knew about dogs. But you proved that the Dr. Doolittle in me needed to be humble. You were the teacher, I was the student. You used dog tools to talk to me, your body language. Sometimes it took me a while to understand. You were insightful; you persevered and didn’t hesitate to break certain rules. You sought comfort on the sofa when your body made you suffer and your pain threshold was low. You were right, and from then on you could have comfort wherever you went. As well as comfort, you also wanted a beautiful dog’s life: freedom, food and care adapted to your needs, to see your friends, to play the way you enjoyed, to socialize with all the neighbours, to hunt and savour your delicious catches (that was the Labrador gourmet in you!) to refuse to bathe, to live life at your own pace, to receive caresses, attention and much more. And simply to distribute love! What a happy life! As a bonus, you became my animal therapist. I was so lucky! Thanks to you and your wisdom, I can share your knowledge on the Internet for all the animals on the planet. Your wisdom is called ABC-Animal. Now you’re 13 years old, you have all your teeth and lots of white hair. For me, you are wisdom and beauty. After 8 years of happiness together, you got sick. I was worried. I took care of you until the end. Just like I promised. As the old saying points out, “When the appetite goes, so does everything else” and you had such “joie de vivre”. Despite your treatments, every day I wondered if you suffered. It became my obsession, to help you avoid suffering no matter what. I asked you to help me: When the moment arrived, you had the choice…either go on your own or send me a clear message. Because egotistically, I wanted to keep you alive, egotistically, I would miss you! There was a ball of tension gnawing at my heart. I woke up at night to watch you breathe and make sure you were still alive. I was afraid of making The Final Decision too soon. Finally, on September 02, 2008, your message was clear. I was with you until the end. I promised you. Your life on earth was over. Our life together will be engraved in my memory forever. I’ll always be grateful to you. 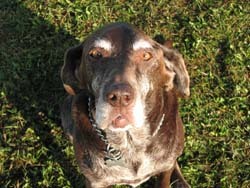 To you, Docky, my adored chocolate milk Labrador, thank you!